And the winner is… Zoho CRM! 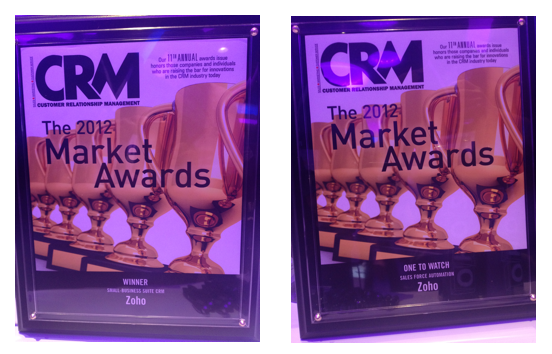 Zoho CRM was awarded by The 2012 Market Awards as the winner in the Small Business Suite category. Conducted by the CRM Magazine, this award rates the top 5 vendors in every category based on a number of factors including customer satisfaction, product functionality and market share. Zoho stepped up its game and stole top spot as our winner with a 4.5 for cost and a 4.0 for functionality. Analysts had plenty of positive things to say about this vendor. “Zoho CRM is cost-effective, easy to use, and continues to add on attractive functionality priced like an a la carte menu, which enables smaller businesses to scale as necessary,” says Leslie Ament, senior analyst and vice president of Hypatia Research Group. John Ragsdale, vice president of technology research for the Technology Services Industry Association, counted Zoho among the “rising stars” for small-business CRM. This year, Zoho gave its user interface a full facelift, added a plethora of features like Pulse for internal collaboration, came out with myriad mobile integrations, and integrated Zoho Support with Facebook and Twitter. For the small business that requires functionality at a price it can afford, “Zoho is emerging as a very strong candidate,” Schneider says. Zoho has that disruptive star quality, he points out, adding that “Salesforce.com disrupted the Siebels of the world and [now you see] Zoho disrupting Salesforce” in on-demand, small-business CRM. It’s not just the Small Business Suite category; we were also rated as the “One to Watch” in the Sales Force Automation category. A newcomer to the SFA ranks this year, >Zoho nudged its way onto our radar screen to take the title of One to Watch. Ament says this is a company with small-business know-how, offering solutions that serve as “an attractive option for businesses requiring basic marketing, customer support, Web conferencing, and sales force automation functionality.” There’s something to be said for getting back to basics. “Zoho is emerging as a very strong candidate for the space…where people just want ‘enough'” to seamlessly close the deal, Schneider explains. We thank you all for the amazing, and continuous support. Well done and well deserved. I’ve been a fan of the Zoho portfolio of products for years. I recommend and train clients in their use and the competitive advantage they can give to SME businesses. My Zoho dashboard is my first port of call when I start work in the morning! Keep up the great (and rapid) work.